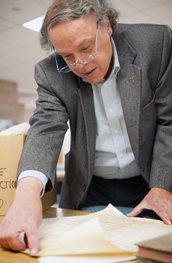 Historical and cultural research is highly valued at the University of Wyoming. The UW's unique geographic setting adds a layer of intrigue to history and cultural studies here. Students studying in these fields develop skills to examine research topics with a local or regional lens, while simultaneously making connections with a global context. Psychology, M.A., M.S. and Ph.D. Professor Phil Roberts studies the history of Wyoming and the West. He is currently working on a comparative analysis of oil development in the American West and the Arab Middle East.